If you thought yesterday’s post about the brown sugar graham cracker part of this was exciting, well: have I got a treat for you. I hope you readied your ice cream makers as instructed, because it’s time to make what is quite possibly my favorite fruit-swirled ice cream ever: raspberry buttermilk. Buttermilk ice cream is sublime, especially for those of us for whom there exists a fine line between “delightfully sweet” and “toothache.” It has its own unique sweet tartness; certainly not lemony-tart, but with a tangy finish so refreshing in a world filled with overly sweet ice cream offerings. It’s a little more sophisticated, I think, but not so much that a kid (or an adult with kid-friendly tastes) would stick up their nose at it. 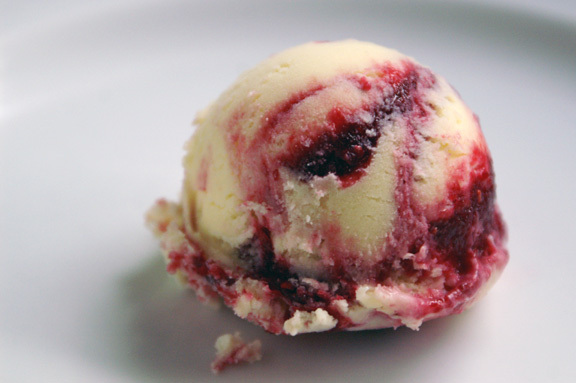 The raspberry swirl adds to the sweet/tart balancing act, and the result is an ice cream approved for year-round use. I adore this ice cream, obviously, on its own. It was astounding how fast we went through this, and I can’t wait to make it again. The buttermilk ice cream can easily stand on its own, believe me, but at the first sight of fresh peaches this year, you’ll see a buttermilk-peach version. It makes me think of that upside-down nectarine cake I still dream about from last summer, and the two together? I may cry. I’m a huge fan of buttermilk and blueberries too, which means a blueberry-swirled version is on its way very soon as well. Bonus: I finally learned how to correctly swirl a variegate into ice cream evenly without over-stirring and thus changing the color. Exciting! My Jeni’s Splendid Ice Creams cookbook has an excellent description (with photos) on how to do this effectively, and I’ll include how I did it in the directions below. If you have the book, look it up; it’s in the front, and it’s a great help. I am one person, which is why there was no way I was attempting step-by-step photos of melting ice cream and swirling variegates. For now, consider this a possible head-start on your Valentine’s Day or Super Bowl party plans: they’re totally make-ahead (in fact, they work best when cookies and ice cream are left to freeze together for a bit), which means less work for you on either day. And if you do make them for V-Day, I can’t think of a better way to end what is sure to be a fancy food-filled evening. If you missed the post on how to make the brown sugar graham crackers, it’s right here. And don’t think for one second that the store-bought alternative is an appropriate stand-in for these ice cream sandwiches; it’s not. Not only will the store-bought ones fall apart in your hands, but your buttermilk raspberry ice cream probably won’t even speak to you if it finds out you short-changed it. Both the buttermilk ice cream and raspberry swirl adapted from Sweet Cream and Sugar Cones: 90 Recipes for Making Your Own Ice Cream and Frozen Treats from Bi-Rite Creamery by Kris Hoogerhyde, Anne Walker, and Dabney Gough. I love this book so much it hurts. in a medium heatproof bowl (I use my glass Pyrex bowl for this), whisk the yolks to break them up, then add about half the sugar (6 tablespoons) and set aside. 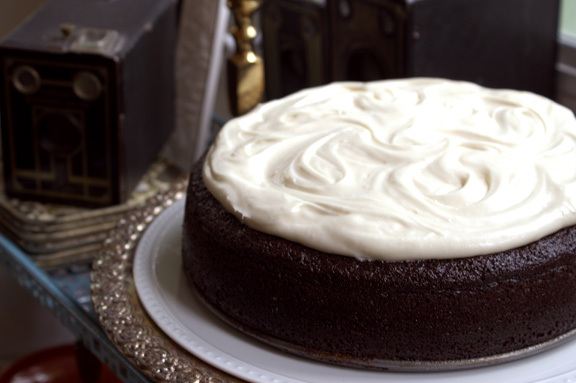 In a heavy-bottomed saucepan, add the heavy cream, milk, and remaining sugar and whisk together. Cook over medium-high heat until it just begins to simmer, then reduce the heat to medium. If you haven’t already, place the bowl with the egg/sugar mixture next to your heated cream mixture; it’s easier this way. Scoop out about a 1/2 cup of the heated cream mixture and, whisking the egg mixture constantly, pour slowly into the eggs. Repeat with another 1/2 cup of the cream mixture, still stirring constantly as you slowly add the hot cream to the eggs. Why? Because scrambled ice cream eggs is so gross, so keep stirring. Pick up your egg mixture bowl, and while now whisking your hot cream mixture, slowly pour your tempered egg mixture into the heated pan of cream. Switch off to a rubber spatula to stir, and keep stirring constantly until the mixture is thickened and coats the back of the spatula, 2-3 minutes longer. Strain the base through a fine mesh strainer into a clean bowl. Choose wisely, grasshopper: your bowl of choice needs to be a bowl which will fit nicely into a larger bowl filled with ice and water (the ice bath), and will need to leave enough space between the two to where the bath can come up along the side. Pick your bowl ahead of time with this in mind. Set the bowl of ice cream base into an ice water bath (just what it sounds like: ice cubes and water, enough to come up and around your base mixture, but not too much that it overflows from displacement. Science!) and stir. Continue to stir your base occasionally until it has completely cooled. Set out a towel and remove your bowl from the ice water bath, setting on the towel to dry off a little. Cover with plastic wrap and refrigerate at least 4 hours or up to overnight. Heat the raspberries and sugar in a small saucepan over medium heat. Stir frequently as your mixture is heating, and cook until most of the liquid has evaporated and the mixture has a jammy texture, about 20 minutes. Keep in mind that the jam will tighten up and “gel” a little more as it cools, so don’t overdo it. If you accidentally do overdo it, not to worry: add a little bit of water and heat it up again slowly, just until it’s warm enough to take in the water and loosen up. Strain through a fine mesh strainer into a bowl, pressing on the solids to extract as much of the raspberry mixture as you can. Let cool completely before swirling into your ice cream. Remove the bowl from the fridge and add the buttermilk and vanilla. Whisk to incorporate. Add the ice cream base to your ice cream machine according to the manufacturer’s instructions. While the ice cream is spinning, set up your components for the swirl. You’ll need your raspberry swirl, the container (or containers, I usually use two small pint containers), a regular size spoon, and a butter knife. You’ll need to work fairly quickly when swirling, so it’s better to get everything set out ahead of time. When your ice cream is finished spinning, begin to layer your containers, doing one at a time if you’re using more than one. 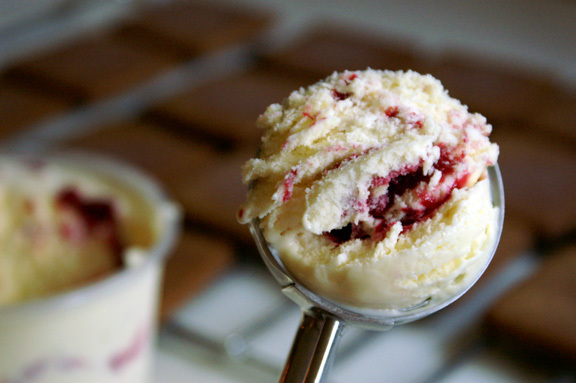 Spread a little bit of your raspberry on the bottom of the container, then add a spatula of the ice cream. Spoon a few more drizzles each time, layering pockets of swirl and ice cream, until you reach the top. Add a little more on the top, then take your knife and dive straight down. Keeping it vertical, move it a few times up and down, working it around the container and watching carefully so you don’t overwork it. If you’ve ever marbled a cake, it’s a similar action. The end should look like you see above: pockets of swirl and sauce, but no pink ice cream. 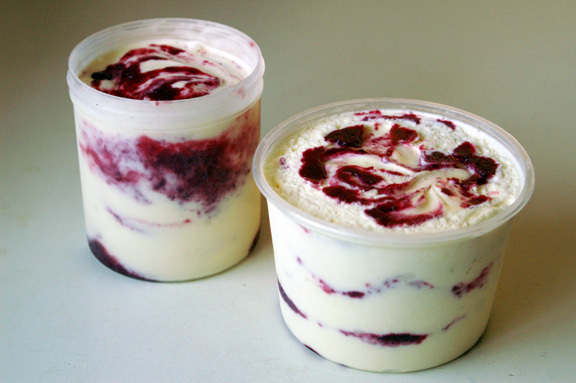 Place your container in the freezer and repeat with any additional containers, as needed. Freeze for at least 4-6 hours until firm. You recall I used a 2 1/2 inch square cookie cutter to cut my graham crackers, right? I did. If you made them roughly the same size, you’ll need a 2-ounce ice cream scoop for this. If you made them smaller, act accordingly and determine which ice cream scoop will be best for your project. First, examine your grahams. Although they should be similar in size, you’ll want to pair them up according to how they work best. If you have any uneven ones, set them to the side, try to find matches for them, and use them last. Secondly, prepare your work surface. I lay the grahams out, leave room for the pints of ice cream, and portion 10 foil pieces out which will be large enough to wrap around the finished sandwiches. It’s best to wrap these individually so they don’t stick together or freeze into each other. Have a small offset spatula at the ready for smoothing the sandwich edges, if needed. Make space in your freezer, if needed, for your final product; I like them on a flat surface while they’re firming back up. Finally, get out your pints of ice cream and begin to scoop. You want a nice, level scoop of ice cream for each (see above photos), and you can accomplish this by firmly pressing against the side of the container to smooth the bottom. Think before you do, however: this is swirly ice cream and you want it to stay that way, so the less you work it, the prettier it will be. Place your leveled-off ice cream ball onto a graham. Take its graham life partner and place it on top, firmly and slowly pushing it down, trying to use even pressure on the top. These should be firm grahams; they’re not going to break like pre-made ones so often do. I think it’s best to focus the pressure in the middle and then work slightly outward at the end. You’ll know to stop pushing when your ice cream looks like the top photo: the ball will be flattened and the ice cream will touch the sides. Smooth the edges as needed using your offset spatula, but again, use care: if you look at the top photo, the top sandwich has no smoothing going on; if you place your ice cream ball and use the correct pressure, you shouldn’t need to do much of that. The bottom one has some smoothing along the sides, and you can see it a bit if you look closely. Perfectly smooth ice cream sandwiches are for boxes in freezer aisles; not for you. So keep it natural unless there’s really a large piece sticking out. Wrap each one up tightly in a piece of aluminum foil and stick in the fridge, flat if you can, for at least 2 hours to firm up. Repeat with the remaining; I had 20 grahams or so, which means 10 sandwiches per batch of grahams, with a little ice cream left over. If you make a double batch of grahams, you’ll have the same problem in reverse, so make a second batch of ice cream, and so on. Bonus tip: assembling these the morning before (or the night before) serving will make for a more “together” ice cream sandwich: it gives the ice cream and grahams a chance to meld together, so they maintain their integrity and don’t smoosh down as much when bitten. pretzel ice cream + pretzel crunch. 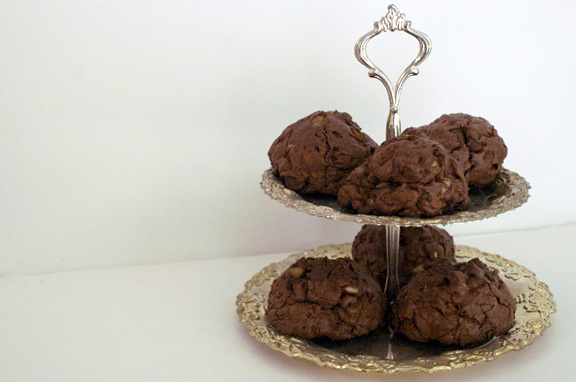 the chocolate chronicles, part three: chocolate chubbies. These are so heavenly… And now you’re adding cookbooks to my already too-long list of ones to buy. I thought that Jeni’s would be the only ice cream cookbook I’d ever need, but now… Bi-Rite Creamery, you’re officially on the list! I love this ice cream so much it hurts! So pretty and swirly and perfectly scooped. You’re on a roll this week missy! ha! thank you, sue! i feel like i’m on a roll this week! it’s been fun to have things really turn out the way i expected them too/hoped they would. the scooping is all credited to my intensely awesome ice cream scoop; it’s a good half-sphere one with the little flippy thing inside which goes back and forth (good professional description there) 🙂 and it does a great job. i recommend it for anyone who wants effortlessly pretty ice cream balls. 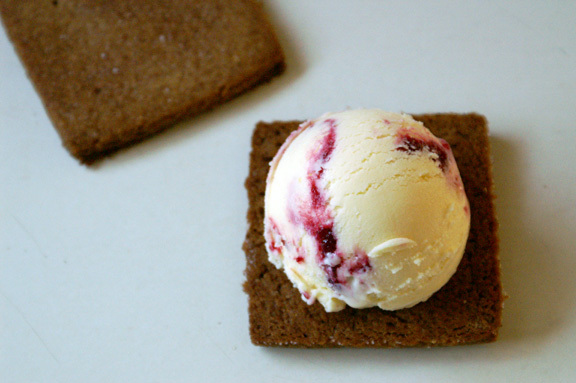 I’m craving buttermilk ice cream, homemade graham crackers, and ice cream sandwiches so badly right now…. And hooray for Jeni! She makes a fantastic strawberry buttermilk ice cream, but I love the jammy raspberry swirl running through your ice cream. It’s much more stunning! Peach and blueberry versions? I can practically taste them, screaming summer and sunshine…. I really really need to attempt making ice cream. I only have a 1/2 pint ice cream maker, which seemed like a good idea in theory (so i wouldn’t have all that ice cream to tempt me), but now seems silly since I don’t want to put all that effort into basically 2 portions of ice cream….so i’ve never used it. This flavor combo sounds totally delicious- I love tart ice cream bases, so this is right up my alley! And pairing it with the grahams…fantastic! 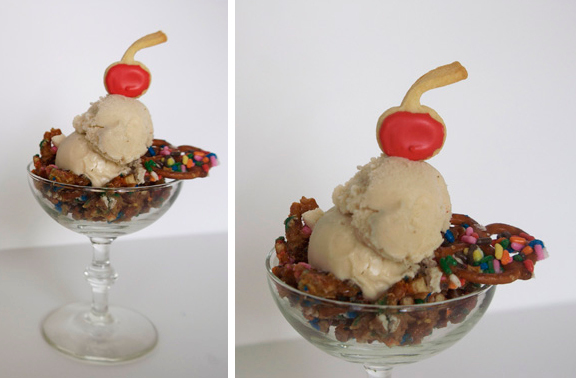 I am totally digging the pro tip on how to properly swirl something into ice cream!! Someday my freezer will be empty enough to hold my ice cream maker bowl again…. sigh. Gorgeous! 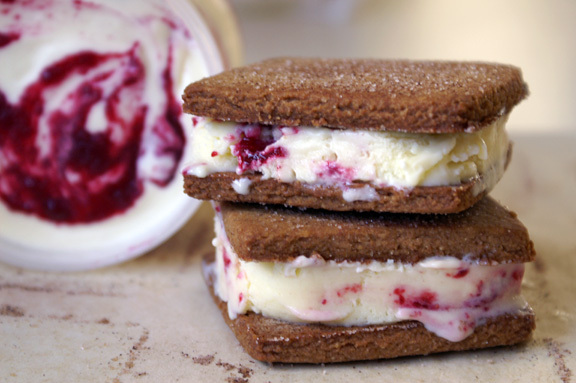 These ice cream sandwiches look divine…love that berry swirl! thanks, sara! I loved making these…always fun to make something you know you’ll like; these were that for me. Just bought this book. Linda says we’re not allowed to be friends anymore. You cost us too much money. Between gummy bear shirts and cookbooks, she’s having second thoughts about our friendship. I told her I can’t quit you. i can see linda’s point; i’d be a financial drain on anyone probably, given my fierce and undying love for cookbook hoarding. But they need homes, right? I mean…right? It’s like adopting. i can’t quit you either. These look like summer 🙂 and a little summer would be wonderful right now. I love home made graham crackers. Why I never used them for an ice cream sandwich is beyond me. I will remedy that mental error! Thanks! Wendy, they feel a little like summer! But not so much that it’s a strictly summer dessert option, you know? Something about berries in the winter seems right sometimes. They make fabulous ice cream sandwiches, i promise you, so next time you make them, try it out! you won’t be disappointed. Yesterday, at the grocery store, 2.0 asked if I had any plans to make ice cream this weekend. I said, “well, I don’t have a recipe on me right now, so… NO.” Because he likes to ask for random things when we are at the shops and I have no properly prepared ingredient lists. WHY DIDN’T I JUST CHECK GOOGLE READER ON MY IPHONE? i enjoy how 2.0 “wonders” if you had any plans to make ice cream this weekend. men can be so subtle. i want you to make this! i don’t even care the fruit; you just make whatever you want, because it’s amazing. buttermilk ice cream is honestly the bomb. 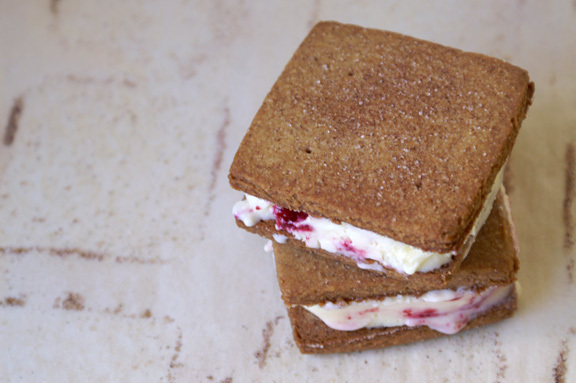 Although it is a cold drizzly morning, I am coveting the luscious Raspberry Ice Cream Sandwiches! Deb, i can completely understand: they would perk up a drizzly day, for sure. Shannon, this ice cream looks wicked good. I love buttermilk ice cream… Heck, I like ice cream period! Shove it in-between two homemade graham crackers, and this is one happy gal! Oooh boy! This looks dreamy fantastical wondrous! Those grahams! That swirl! My tummy! if you just told me you’re going to try and make ice cream sans ice cream maker, i bow. What, do you just pack up a bunch of snow around a bowl or something and continuously stir for 20 minutes? I can totally see you doing that. in snowshoes. i am surprised at the Jeni’s cookbook! there’s some great stuff in there though…she’s got a nice sense of style for ice cream flavors, i think. Hah, yeah, you see, we keep it so cold in the house that I have to walk around on snowshoes to keep my toes from getting chilly on the permafrost floor. I actually make a lot of ice creams without an ice cream maker, I just stick with custard-based ones, and let them freeze up in the freezer, stirring occasionally as they freeze. And it is creamy and delicious! monday bites: diy dessert bar.